Beck is a Psychologist who explores the Psychological implications of something he calls, “Disgust Psychology.” His “thesis” is that human “disgust” becomes a prominent “boundary” psychology and mechanism within local churches that deter us from our missional vision and call from Jesus. The central argument of the book is that psychology of disgust and contamination regulates how Christians reason with and experience notions of holiness, atonement and sin. The psychology of disgust also regulates social boundaries and notions of hospitality that should be embedded within the body of Christ (i.e. local church). Disgust psychology causes us to “run” from fully embracing “incarnational” theology. He believes that the missional church needs to embrace what it means to follow Jesus into a “world of the unclean” without fear of contamination instead of being deterred by the implications of disgust psychology that will always tempt Jesus followers to separate, withdraw and quarantine ourselves in safe “churchy” places. In seeking purity and holiness (that demands boundaries and quarantine) the church pulls away from sinners…disgust psychology prevents us from doing what Jesus did, that being, embracing a radical hospitality that rewrote the “rules” of how we see people through the lens of mercy and love. 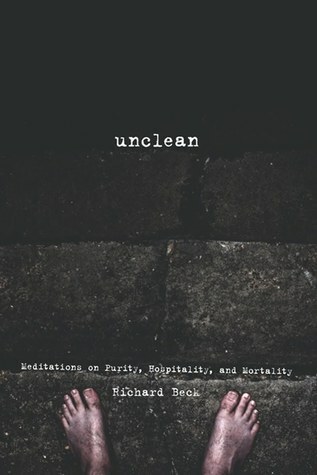 Beck writes, “disgust erects boundaries while love dismantles boundaries.” He says, “the pull (to be pure) is so overwhelming that the desire to be “clean,” “pure,” or “holy” begins to trump other considerations: the need to welcome others or the importance of facing our own need and vulnerability. The will to purity always dominates the faith experience." He says that churches instinctively create “moral circles” around their clan, tribe or “kind.” People outside of that “circle” are treated with indifference, hostility and/or pragmatism. In fact, he quotes anthropologists and other researchers in saying that, “humankind ceases at the end of the border of the tribe.” I can’t even think of another incredibly personal way of defining some of the issues churches have in moving beyond tribe…Beck calls what many church bodies do to people outside of the tribe, “infra humanization” (which is a belief that outsiders does not possess some vital or defining human quality that renders them “less than human”). He writes, “when religious life comes to be dominated by holiness and purity categories, two things happen. First, social stigmas are created to protect our purity, pushing people away who are threats to our holiness. Second, the purity emphasis creates an otherworldly focus on the spiritual, eventually privileging the spiritual life over the life of the body. The Lord’s Supper actually is a regulating ritual that pushes against the temptation (Gnostic really) to deny and condemn the realities of the human body. I could go on all day about his book and its applicability – his total embrace of hospitality, his hermeneutical journey through the Matthew 9 text where Jesus has table fellowship with “tax collectors and sinners” (his paradigm for that which touches off our reaction of disgust). He writes extensively on the “will to embrace,” the church’s incarnational ambivalence, and the fact that he believes strongly that the Lord’s Supper is that ONE event in the life of the church which ties us into Jesus’ practice of table fellowship and radical hospitality as well as shapes our missional imagination. This morning, I decided to expand my knowledge of Beck and his work by bookmarking his BLOG and listening to a couple of his talks on YouTube. Truthfully, I've been blessed and challenged by his work and passion in teaching this material and his research. All I can say is "check it out."